It is somehow appropriate that I write this while sitting in the Dusseldorf airport because it is about a German actor and one of the best of the first part of the 20th century. 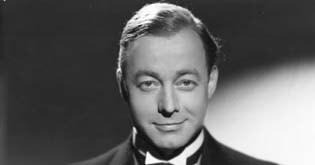 Heinz Ruhmann played Watson only one time and that was in the movie “Two Merry Adventurers”, at least that was what it was called in the US in 1937. In Germany it was called “Der Mann, der Sherlock Holmes War” (The Man Who Was Sherlock Holmes). and they are released to continue pursuing their love interests. The movie is really quite an entertaining comedy. It is hard to run down. It was put out on VHS years ago but I haven’t been able to find a region 1 DVD yet. Curious note – this was one of the two films found in Adolf Hitler’s bunker after the war. The other was “Der Hund Von Baskerville”. Strange that he should have two films about an English hero. 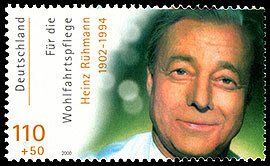 Heinz Ruhmann was born 7 March 1902 in Essen Germany and died 3 October 1994 in Bavaria. At the time of his death he had 111 films to his credit and was active on TV up until his death at the age of 92, an astounding feat. He grew up in Wanne-Eickel and Munich. He never graduated from secondary school but by 1920 he had started his acting career on the stage in Breslau, Hanover, Bremen and Munich. He made his first movie in 1926 and made the transition from silent to talking films in 1930. He had an exceptional speaking voice which many in the silent era did not. He co-starred with Hans Albers on a number of occasions, playing street smart characters that eventually get their comeuppance. By 1938 Ruhmann was producing his own films and playing on the Berlin stage. bed in the secret rooms she shared with her family in Amsterdam. How many Watsons have a stamp? Ruhmann was married 3 times. He was divorced once and widowed once. He had one son Peter Ruhman. 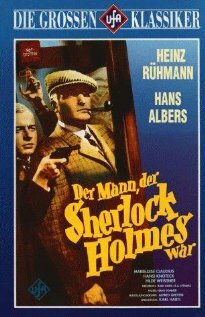 There was a region 1 DVD of “Mann der Sherlock Holmes……..”.It’s probably out of print but Oldies.com must have some.